The process of writing and publishing includes rejection as part of the process. God uses rejection to help us clarify and refine the vision of our work. This painful experience and how we handle it can determine the course of our life’s work. God is very interested in our work. When I handle my rejection as a spiritual matter I bring God in to the solution. Three steps are presented in Andy Stanley’s excellent book Visioneering, using Nehemiah as a model for handling criticism. We go back to these steps in times of rejection and criticism. That is how to handle criticism. We needed to remember that today. Anyone else? 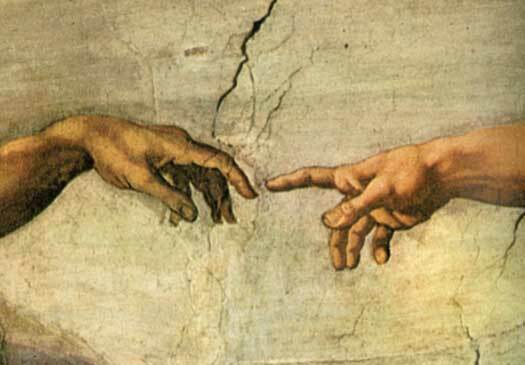 The struggle for man and God to connect. Holy processions with robes and incense. Slow and majestic with chest rattling chords. Voices raised in song and Alleluia. Bunny and eggs mixed in the celebration. All blurred by the incredible image of a man, crucified, rising from an empty tomb, showing us the eternal – inviting us into the spiritual. God pulls us into the mysterious, away from the candle lit rooms to the frighteningly beautiful and indefinable vastness of Him. Away from the procession with its safe prescription to holiness to the free fall of Love. Away from the hymnal and chords to the music of the spheres. From temporal to eternal. From darkness to light. From death to life. It’s often the small things that are my undoing. I know to gather my strength and to pray for life’s large challenges but what about the petty annoyances that come every day, every hour and even every minute? Phillip Keller wrote about the 23rd Psalm from a shepherd’s perspective. Particularly interesting to me was the act of “anointing with oil”. The shepherd would anoint the sheep’s head with oil for protection against annoying and dangerous gnats and flies. Only the strictest attention to the behavior of the sheep can forestall the difficulties of “fly time”. At the very first sign of flies among the flock he will apply an antidote to their heads. I always preferred to use a homemade remedy composed of linseed oil sulfur, and tar, which was smeared over the sheep’s nose and head as a protection against nose flies. Once the oil had been applied to the sheep’s head, there was an immediate change in behavior. Gone was the aggravation, gone the frenzy, gone the irritability, and the restlessness. This, to me, is the exact picture of irritations in my own life. How easy it is for there to be a fly in the ointment of even my most lofty spiritual experience! So often it is the small, petty annoyances that ruin my repose. I’m starting my day with this prayer. When I first begin a new writing project I am filled with excitement and hope and promise. I have no idea what the finished product will look like, but I eagerly rewrite, get critiques, rewrite again and again – all the while watching a transformation take place. I eventually pass it on to an editor and illustrator, where more transformation occurs. Then eventually, it is finished. When I think of my Christian life with its ups and downs, struggles and triumphs, joys and sorrows, I realize that I, too, am being transformed. I start with great excitement and hope and promise; then transformation begins. It’s hard work, but slowly I am transformed more and more to the image of Christ. Best of all, there is a moment coming when all the work will be done, and I will see my Savior face to face. It is hard to imagine what such a moment will be like – the magnification of joy and awe and wonder. We read about, talk about, learn about, and even talk to Jesus, but seeing Him face to face … oh my, what a day that will be! What can a donkey teach us about writing? Recently at a Bible study I was challenged to experience Scripture with all five senses. When we read the stories with our senses, we begin to think: What did it smell like? What did it sound like? What did they feel? What did they see? What did they hear? The stories become alive and real as we enter the scene with our imaginations. God gave us the senses to help us experience the world. When we bring those five senses into our writing we make our writing come alive for the readers. We’ve been working on a Christmas story, and what better way to deepen our writing than to visit a farm. 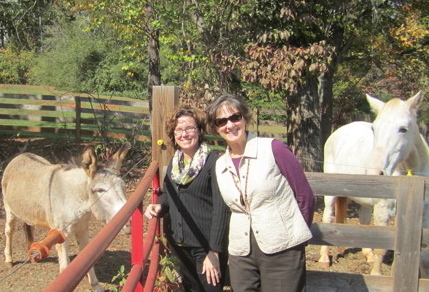 With Priscilla, our donkey friend, we were able to experience the farmyard sensations first hand. 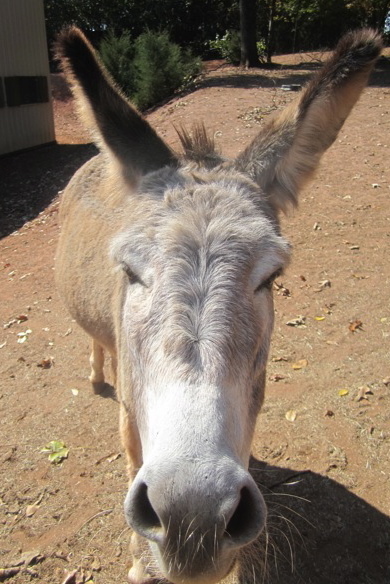 When we write about Mary traveling to Bethlehem, and think that she may have ridden on a donkey, we want to know: What did she see when she looked down at the donkey’s ears? What did her hand feel resting on his neck? What did she hear? And of course there were smells! When we write about Jesus being placed in a manger we need to remember the sounds of animals and the smells of a stable. The Son of God came to earth and experienced the fullness of the senses. Our visit gave us the details we needed and brought life into our writing as we worked on our Christmas story. God has blessed us with sights and smells, sounds and tastes and the ability to touch. Today may I write with all five senses!